The debate over regional trade agreements is ongoing. It has been argued that they can heighten exposure to shocks as they lead to more specialisation, and conversely that they can alleviate volatility by improving policy coordination within the anchors of a formal trade contract. This column suggests that the benefits from lowering long-term growth volatility tend to dominate potential costs, with the magnitude of this effect depending on the depth of the regional integration and the development stage of trade partners. There has been renewed interest in membership in regional trade agreements (RTAs) since the beginning of the new millennium, on a scale not seen since the proliferation of agreements in the 1970s. The number of countries belonging to at least one RTA soared from around 70 countries in the late 1970s to close to 200 countries by 2012. 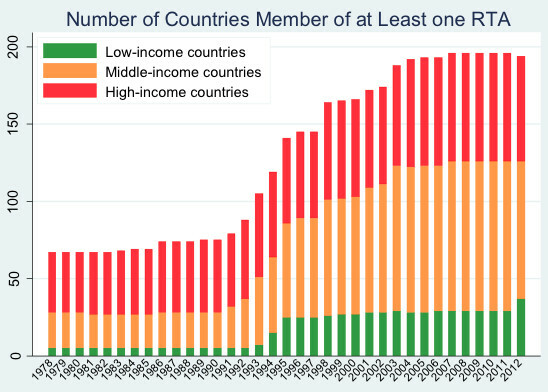 This was mainly driven by middle-income countries, while lower-income countries lagged behind the trend (Figure 1). 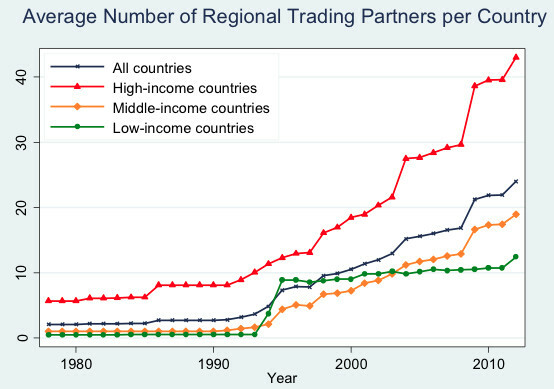 The number of regional trade parners also increased significantly, reflecting partly membership in multiple, and often overlapping RTAs (Breinlich and Cuñat 2013, Hornok and Koren 2016). Sources: De Sousa (2012) and authors’ calculations. This comeback of RTAs is a departure from the 1980s, when they were perceived as a threat to the multilateral trading system and considered a second-best choice to broader trade liberalisation. 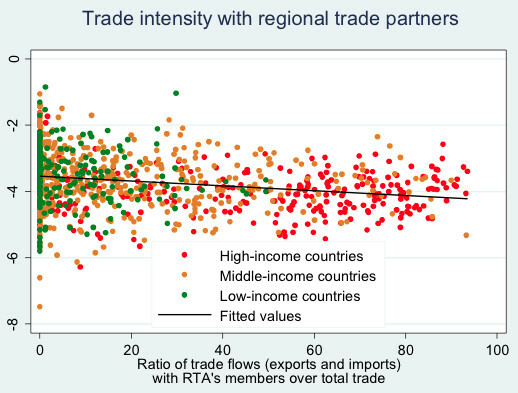 Although RTAs create trade, they also divert it by excluding countries from trade agreements, creating welfare losses. 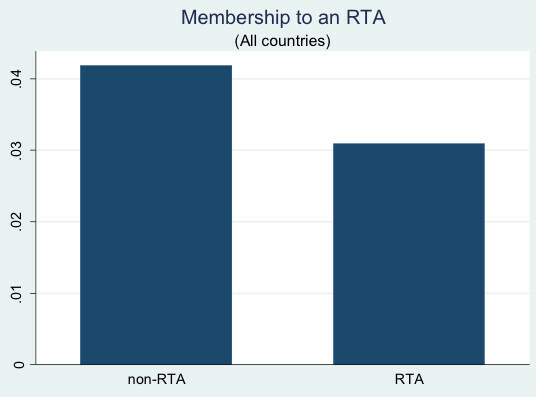 With multilateral trade negotiations having stalled under the WTO – particularly since the start of the Doha Round – RTAs have increasingly been viewed as substitutes for broader trade liberalisation, in part because they can be easier to negotiate and implement. Furthermore, RTAs could bring additional benefits compared to no liberalisation, such as reduced volatility, but this factor has attracted less attention in the literature and in the policy debate. In a recent paper, we investigate this relationship (Kpodar and Imam 2016). How do RTAs impact growth volatility? Theory is ambigous about the impact of an RTA on growth volatility, with many of the arguments that apply to multilateral trade liberalisation also applying to RTAs. On the one hand, theory predicts that as a country joins an RTA, it may specialise in products in which it has a comparative advantage. RTAs could, therefore, lead to less product diversification, a narrower export base, and, hence, create higher vulnerability to shocks in an open economy (Grubel and Lloyd 1975 Krugman, 1991). There is empirical work supporting these theoretical conclusions (e.g. di Giovanni and Levchenko 2009). Moreover, a narrow export base encourages procyclical fiscal policy with adverse effects on output fluctuations (van der Ploeg and Poelhekke 2009), raising volatility further. On the other hand, RTAs have also special features which, looked at in turn, could reduce growth volatility. First, with an RTA, domestic firms gain access to a larger market, and thus may face demand for new products that could enlarge their production base. Second, better policy coordination in an RTA – the prevalence of a formal international agreement ensures the external enforcement mechanism provided by an RTA to overcome domestic political pressures – also fosters the implementation of sound macroeconomic policies, leading to a more stable growth path. Haddad et al. (2010) underscore that the disciplining nature of international competition and the prevalence of formal international contracts could potentially deter domestic policy mistakes, and therefore reduce growth volatility (Cadot et al. 2009 find that a RTA significantly reduces the volatility of barriers to agricultural trade throught its commitment effects). Finally, RTAs can further reduce growth volatility by reducing the likelihood of conflicts as they offer a political forum that facilitates settlement of disputes (Martin et al. 2012). A glimpse at the data suggests that countries in an RTA tend to experience lower growth volatility than others (Figure 2). More importantly, the depth of the regional integration matters as countries that trade more with their regional trade partners enjoy more stable growth. Sources: IMF, De Sousa (2012), Barbieri and Keshk (2012) and authors’ calculations. Our empirical results confirm that RTAs are indeed associated with lower growth volatility. We also find that partial-scope preferential trade agreements, which are generally shallower agreements, have no meaningful effect on growth volatility, unlike free trade areas and custom unions. This reinforces the idea that the depth of regional integration matters. Further, our findings lend support to the policy credibility channel. A country with weak institutions, by ensuring that its trade policy is conducted through a credible international treaty, is likely to have a trade policy that is more credible, thereby reducing uncertainty. Particularly in agreements that involve north–south partners, the effect on reduced growth volatility in developing economies is most pronounced. Are RTAs a response to growth volatility? Another way to assess the critical role of RTAs in mitigating growth volatility is to investigate whether countries that are more prone to shocks are more likely to chose to join an RTA. There is an extensive literature on why a country may want to sign an RTA (Whalley 1998, Baier and Bergstrand 2004), but these studies overlook the role of volatility. To address this gap, we build on Baier and Bergstrand (2004) to estimate the probability of joining an RTA. The results reveal that countries vulnerable to growth shocks tend to join an RTA in subsequent periods, and interestingly, the probability of joining an RTA declines with the relative strength of growth volatility of future regional trade partners compared to other countries. Our findings have straightforward but important implications for the debate on the virtues versus pitfalls of trade arrangements. The findings suggest that there are indeed gains from RTAs, more so for low-income developing countries, which also tend to be more vulnerable to growth volatility. Thus now is a good time for these countries to pick up the pace of trade integration and reap the attendant benefits. Breinlich, H and A Cuñat (2013), “Predicting the effects of regional trade agreements: Can heterogeneous firm models help?”, VoxEU.org, 7 September. Cadot, O, M Olarreaga and J Tschopp (2009), “Do Trade Agreements Reduce the Volatility of Agricultural Distortions?” Agricultural Distortions Working Paper No 50303, World Bank. Easterly, W, R Islam and J E Stiglitz (2000), “Shaken and Stirred: Explaining Growth Volatility”, mimeo, World Bank. Grubel, H and P Lloyd (1975), Intra-Industry Trade, McMillan. Haddad, M, J Lim. and C Saborowski (2010), “Trade Openness Reduces Growth Volatility When Countries are Well Diversified”, World Bank Policy Research Working Paper No. 5222. Hornok, C and M Koren (2016), “The Case for Free-Trade”, VoxEU.org, 7 May. Kose, A, E Prasad and M Terrones (2005), “How Do Trade and Financial Integration Affect the Relationship Between Growth and Volatility?” IMF Working Paper WP/05/19. Kpodar, K and P Imam (2016), “Does a Regional Trade Agreement Lessen or Worsen Growth Volatility? An Empirical Investigation,” Review of International Economics 24(5): 949-979. Krugman, P (1991), “Increasing Returns and Economic Geography,” Journal of Political Economy 99: 483-99. Martin, P, T Mayer and M Thoenig (2012), “The Geography of Conflicts and Regional Trade Agreements”, American Economic Journal: Macroeconomics 4(4): 1-35. Raddatz, C (2007), “Are External Shocks Responsible for the Instability of Output in Low-Income Countries?”, Journal of Development Economics 84(1): 155–187. Rodrik, D (1997), “Has Globalization Gone Too Far?”, Institute for International Economics, Washington, DC. See Kpodar and Imam (2016) for details on the empirical model and the definition and sources of the variables. We control for the level of development, trade openness, domestic and external shocks, and financial instability.